Franziska von Karma is around planes a lot. She's always flying. Whether it be at Hope Springs Airport investigating a murder and smuggling, or International Departures flying back to Europe on a death wish because she's lost all meaning in her life. Makes sense for her to hang around Pilotwings. Franziska also enjoys whipping people, and whips count as melee weapons in Super Smash Bros. Ultimate. It's her defining character trait. That, and calling people fools. She loves taunting defence attorneys in the courtroom. Franziska's whip apparently has electrical properties in some adaptations of her, making Zero Suit Samus the perfect choice for her. Her father was also known to carry a stun gun as well, which fits her own B-move. She's an aggressive Attack Type Spirit, as you should expect from a prosecutor. She dreams of being the best and perfect, which I think makes Tomorrow Is Mine rather fitting for her. Once you beat her, she'll be a Support Spirit that improves the power of your weapons, including whips. She arguably spends more time as a supporting investigative partner to Miles Edgeworth than as a primary prosecutor, so it's fitting in that way too. Franzy's Whippity-Whip Trip. Featuring whips and a trip on a plane. And Larry Butz himself. Franziska von Karma is certainly feisty, isn't she? Ludwig would like to note that he has no relation to her despite the whole VON thing. Larry Butz is also unrelated to Larry Koopa despite the whole LARRY thing. Anyway, you're free to suggest changes or ideas for Franziska's battle in the comments section. The preceding Spirit Battle in this series is for Maya Fey! And the next one is fellow prosecutor Godot. I think it would make more sense for her support ability to be "Whip Attack ↑" Or perhaps since that's quite specific and Weapon Attack ↑ only takes up one Support slot in any case, "Whip Attack ↑↑". 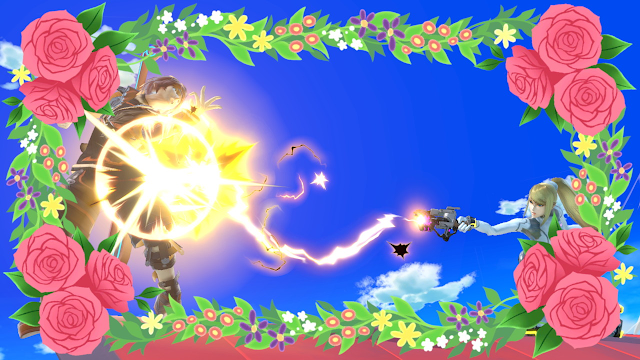 It would work with ZSS's relevant attacks as well as the Belmonts and perhaps even Samus and Dark Samus' Grapple Beams? One of the rules I've set for myself is that every concept I make has to fit existing parametres in the game. That includes not introducing any new stages or music not already in the game, as well as new abilities or condition/rule types. Weapon Attack ↑ exists already and applies to whips. Whip Attack doesn't exist already. Oh, I see. No doubt I was thrown off since, as you may recall, I believed that the effect you gave Maya Fey (to extend transformation effects) already did not adhere to this. Even though you did tell me otherwise in that case. Sorry! I don't know exactly if Weapon Attack ↑ is less effective than Sword Attack ↑. One can test these things in training mode but I don't feel like it. Same with Fist Attack ↑ vs. Physical Attack ↑.